Tracing Jakarta’s History | What an Amazing World! Horrendous traffic. Gray sky. Choking air. It is not a surprise why Lonely Planet says Jakarta is a city many find it hard to love. With more than 10 million people sprawling over narrow streets, dense neighborhoods and filthy riverbanks, many struggle for a quality living in this city. But looking back to its history, one would comprehend why Jakarta has grown into such a megacity. 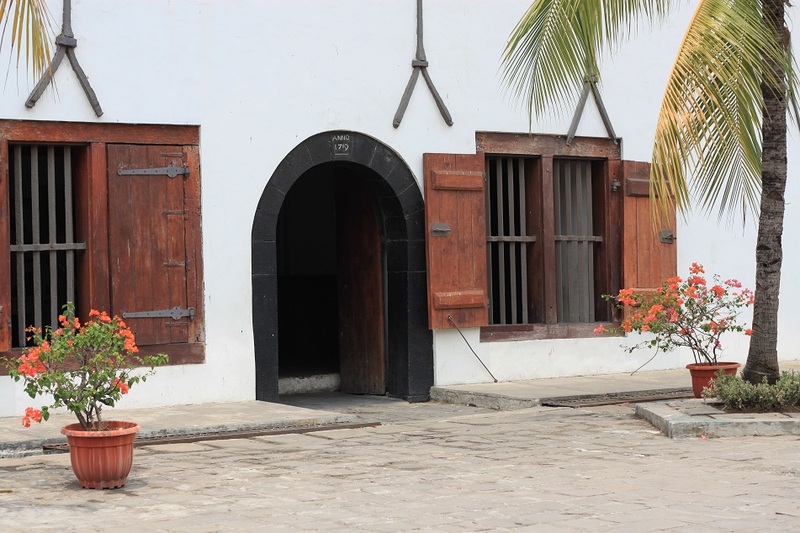 Founded in the 4th century as Sunda Kelapa, it has always been an important port for spice trading even before the arrival of the European explorers. In the early 16th century, the Portuguese was the first European nation to arrive at the port, en route for the source of the spices. Their expeditions opened up a direct access for the Europeans to the once-as-precious-as-gold spices – instead of buying them from the Arab traders. However, it also started a new chapter of centuries of ferocious battles amongst European powers to gain control of the spice route – hence the dawn of European colonization in Asia. The Dutch emerged as one of the most prominent powers in the region which lasted for centuries. They arrived at Sunda Kelapa in the late 16th century and completely gained control of the port in the early 17th century by defeating local ruler and sending all the British home. 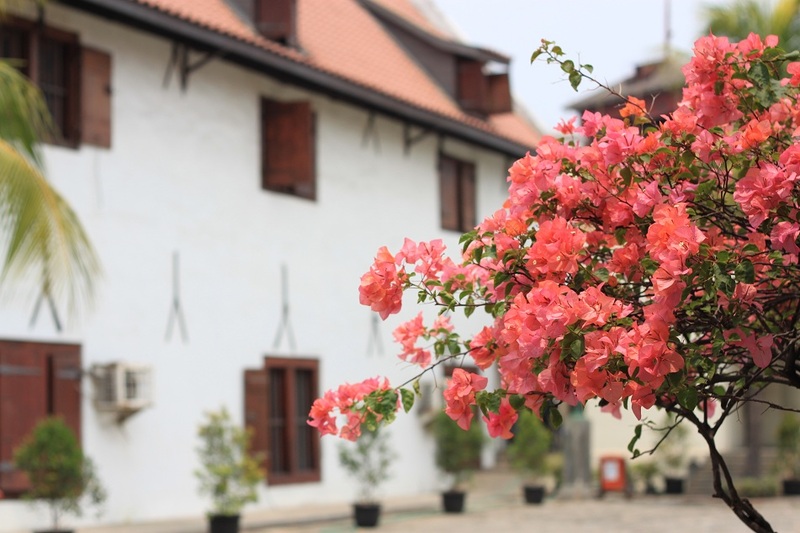 Under their rule, the Dutch changed the name of the port town into Batavia, which over centuries grew as a major port in the spice trade route in Southeast Asia. Under the Dutch Empire, Batavia and other colonies in the Dutch East Indies contributed to the rapid increase of wealth for the growing European power who had gained independence itself from Spain in the 16th century. Decades after gaining its own independence in 1945, Indonesia as the main successor to the Dutch colonies in Southeast Asia has grown rapidly alongside other Asian economies. Jakarta – the new name for Batavia – as the economic and political center of the country lures people from other provinces to come in hope for a better life. It is a typical Tuesday in the ever busy Jakarta. James and I head to the old quarter of Jakarta in search for the remnants from the time of the Dutch colonization. Any trip around Jakarta on weekdays will not be complete without getting stuck in the notorious traffic jam – called macet in Bahasa Indonesia. In a deserted area on the embankment of a polluted river that flows through Kota Tua – Jakarta’s main old town quarter – I park my car and continue to our destination on foot. Sunda Kelapa. It still bears the name of the old port on which the Dutch first set afoot on the island of Java. 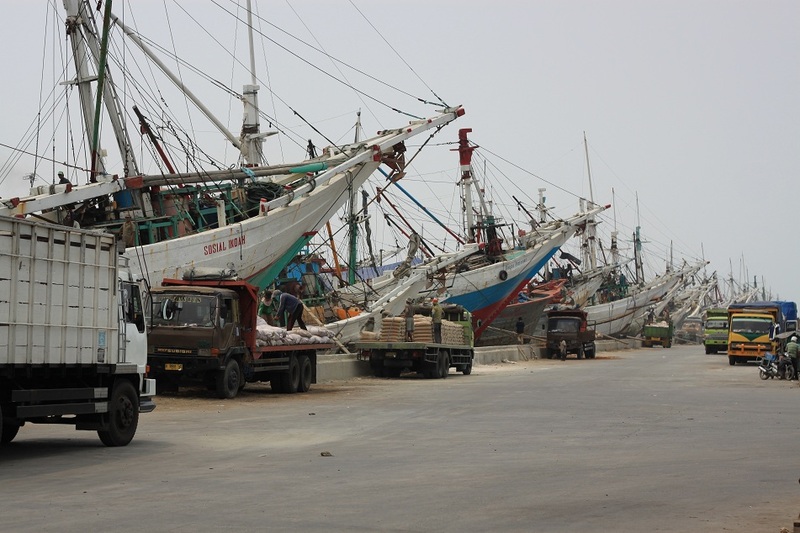 But today, Sunda Kelapa is only a minor port, serving small-scale trades between Indonesian islands. In a hot and humid day, we arrive at the port after a detour due to a misleading sign which brought us to a busy street loaded with heavy trucks. Rows of pinisi boats – the traditional boats originated from Sulawesi – dock on the port with their bows facing the open sea, ready for their next sails the following night. Only slightly modernized – motorized and equipped with cranes and most likely also GPS receivers – the boats are vital to the economies of some regions across the archipelago. 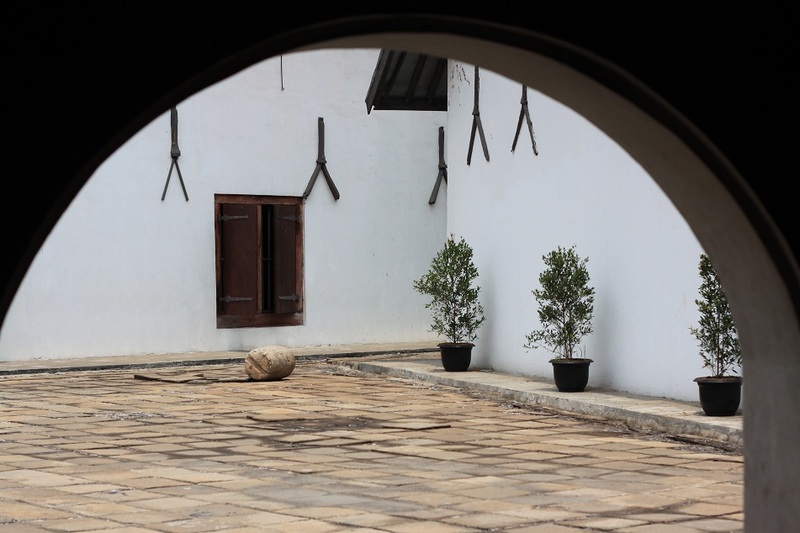 After getting some pictures of Sunda Kelapa and Museum Bahari – Maritime Museum – which we visited on our way to the port, we walk to the heart of Jakarta’s colonial district, following a path we should have taken before. Fatahillah square – named after the national hero who ousted the Portuguese from Sunda Kelapa and renamed it into Jayakarta – is the main square of the old district which is surrounded by some of the most important buildings in the Dutch colonial time, including the Governor General’s office, the supreme court and the central post office. Today, most of them have been converted into museums. Crumbling old buildings and the stench from the polluted river give a mixed feeling for anyone visiting this place. If more efforts are taken seriously to restore and revitalize Kota Tua, one day this old quarter will undoubtedly radiate its past allure and become an oasis in this ever-bustling city. Thanks! I tried to find out the name of that flower, but to no avail. Oh thanks a lot Chris! I think the top photo features a pink azalea. I love that photo too – well done! 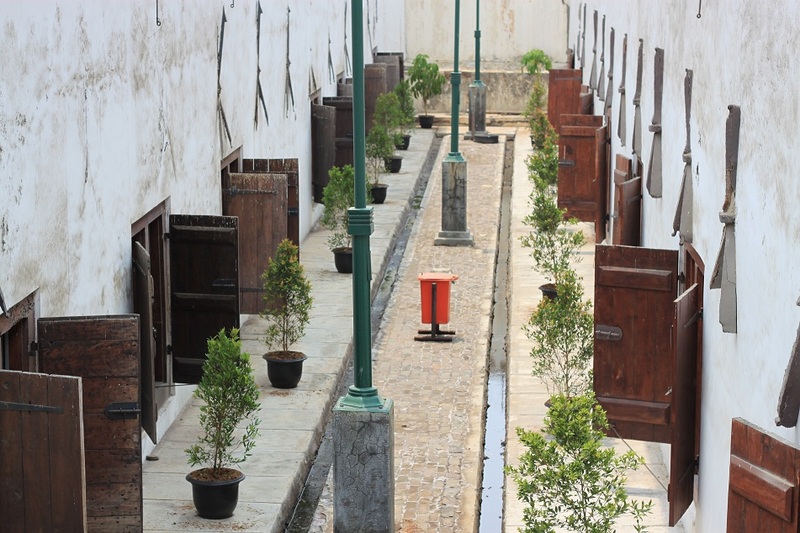 I hope not only they remain preserved, but in the future Kota Tua can be an idyllic place. My pleasure to share this post! Thanks! Thanks for taking me around Bama, it was such an experience! Kota Tua is really a beautiful part of Jakarta, there’s so much potential there and I can only hope the authorities invest in restoring it and cleaning up the rivers/canals. My pleasure James! Yeah, I surely wish the same. It would be great to have a well-maintained Dutch quarter in Jakarta. I would come to this place every now and then when it is cleaned up. Oh wow! Those are tons of problems! I hope one day a great team would come up with better ideas to revitalize Kota Tua. Thanks for sharing the article! Thanks for dropping by, Hero! Excellent post Bama, interesting to read about the rich history of Jakarta. I visited for about 4 days a few years ago and though huge and crowded, I as fascinated by the life, and the action. I would love to return again for another visit and some exploration. Thanks Mark! Honestly you are one of only a handful of other travelers that I know who want to go back to Jakarta. I hope when you return, Jakarta will be a much better city. glad you found some beauty there, the flower photo is beautiful. We found it to be the arm pit of southeast Asia. We road bicycles around Indonesia (Bali, Lombok, Sumatra, Java) for four months, I don’t think I have ever breathed so much engine exhaust in my life as we did in Jakarta. Oh wow, riding bicycle around Bali, Lombok, Sumatra and Java sounds really amazing and so much fun! About the engine exhaust, I hope the new governor brings some changes so that Jakarta can be a better city to live in. Thanks Nancy! Hi Bama, very nice narrative of the history of Jakarta. Does the world Jakarta means anything? I enjoy your photos of the museum, especially the ones with windows and courtyard. Thanks Marisol! I just checked on Wikipedia and it says Jayakarta, after which the city got its current name, means “victorious deed” or “complete victory”. You managed to capture some of the charm Bama. Jakarta sounds like any large Indian city. We too live in the hope that a visionary government will sort out all our infrastructure issues. Seems more and more like wishful thinking though. By the way Jayakarta means victorious deed in Sanskrit as well! In fact Jaya is a common Indian name! I guess it’s a problem shared by many cities in developing countries. In the end, many blamed at the lack of funding. But I believe creativity and the willingness to cut down bureaucracy would help a lot. Thanks Senjaya! It’s quite easy to get to the port. Just follow the street parallel with Kali Besar. Pingback: Politics, Religion and Art at Jakarta’s Focal Point | What an Amazing World!